In 1879, Marcelino Sanz de Sautuola was led by his young twelve year old daughter leading to the discovery of these famous cave paintings. During the mid 1880s, the cave was excavated and the paintings were labeled as Paleolithic in origin. It was believed by many French specialists, such as Gabriel de Mortillet, that due to the artistic quality of these paintings that Marcelino ordered a contemporary artist to create these paintings. Not until 1902, until several other paintings such as these were found in the area, was it believed that this was not a hoax and these paintings really of Paleolithic in origin. It is a shame considering Sautuola had died less than fourteen years earlier. Dating and evaluation are still being completed to this day discovering the age of these paintings to be nearly between 25,000 and 35,000 years old. The caves of Altamira were opened to the public until the 1960s and 1970s when the carbon dioxide in the breath of the many visitors that began to damage and deteriorate the paintings. During 1977, the caves were completely closed to the public, until limited access was allowed in 1982. These paintings led to the influence of many painters, such as Picasso, who declared “after Altamira, all is decadence”. On September 12, 1940 the cave paintings of Lascaux were discovered by four teenagers Marcel Ravidat, Jacques Marsal, Georges Agnel, and Simon Coencas. The cave was was opened to the public in 1948, but by 1955 the carbon dioxide from the visitors damaged the cave paintings leading to the closing and preservation of the cave in 1963. The rooms of the cave include The Hall of the Bulls, the Passageway, the Shaft, the Nave, the Apse, and the Chamber of Felines. 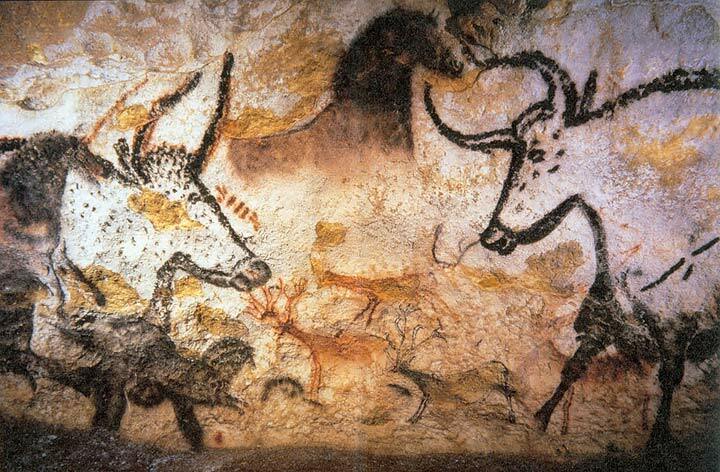 Some reproductions of the artwork led to the creation of Lascaux II that was a replica of the cave halls. Lascaux II was created in order for the preservation of the original cave artwork. This cave, just two hundred meters away ended up being infested with fungus and black mold that led to the close of Lascaux II. The cave contains nearly 2,000 figures which are grouped into three major groups animals, human figures and abstract signs.